Maybe, but I haven't checked it since Dec! I was thinking of using it for a second exchange choice. @leonArdo@margin, can you give us all of the parameters for that eth/btc run? The 3.7.7 arm version is available. It still crashes if you close an active tab. Workaround is to focus on another tab and close it. If you want to migrate to a different computer do you zip the .leonardo folder and paste it in? will this work even if you change to a different os? Also, is there a user manual? So many parameters and no clear guide. It works like the following. There is a signal trigger line shown in the chart. If you have a Min effective gain set, it can mean the signal threshold is shifted but this is also visualised in the chart so you can see exactly where it is too. This signal line is triggered when the opposite order book intersects it. That means for a sell signal line the top of the buy side order book has to hit it. The BB bot will then trigger a spot order. But wait, the spot order won’t necessarily go through at the exact price of the trigger. Why? Because the order book does not have infinite depth at that price. In fact the order book is fluid and in constant motion. Therefore by the time the sell spot order (actually a low price limit order as most APIs have no native support for spot orders) lands at the exchange the order book may may retreated back again or indeed advanced to a higher price. If it retreats back the spot order has to overcome the spread and a potentially shallow order book. That can mean a sell order becomes a completed trade at a price that is lower than that indicated by the original sell signal trigger. On the other hand if you are lucky the price will have increased and you will get a better price. There is no way to ensure a specific price with a spot order. One thing you can do to mitigate the chance of the bot making a loss is to set a higher Min Effective Gain. do you plan to work with binance? I think this question gets asked at least once a day. The Leonardo team intends to release support for Binance in a later update. Jonathan, thanks for all your support of your software. Is there any plans in the future to be able to run the bot for GDAX,com exchange? I havent scrubbed this thread to see if its already been addressed. I'm interested, but why do you want to use GDAX, it is so limited and doesn't have trading pairs? I agree about volume, but still the "large coin/small coin" pair trading seems to me what leonArdo does best. Just purchased my first bot, this one. Waiting for the team to modify it for me, whatever that means, excited to start! Do you guys keep track of your profits somewhere? New here too. I thought it was kind of funny that they said they were building a custom version. It's the same program as the demo, they just need to enable your api key. Good question about profits. Lot's of tiny profits and losses, hard to figure out what's really happening. Feature request: optionally play sound when bot sells or buys. This way you can switch to leonArdo app and check out what's happening. Heres a link to a trade log, which may help keep track of trades. Heres a link to one i've made for myself. It's fairly basic and only supports trades on poloniex and hitbtc presently. For leonardo, you would have to copy and paste the trades for each pair separately. however it makes more sense to just get the trades from your exchange until they implement this feature. Hello, i have a trouble with Margin maker strategy. 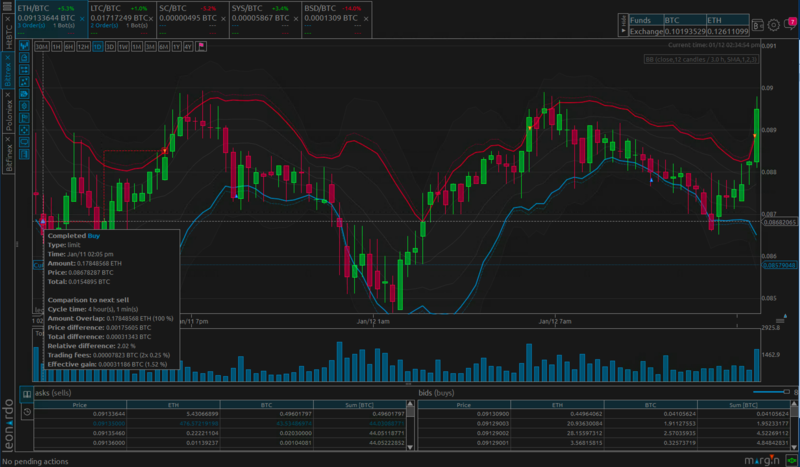 I don`t use it since a week ago when i bought magin maker program(i use a bollinger bands bot,and it works great). Tonight i start autotraiding with Marin maker strategy few times. Program places order(i see it in active orders), but when i came to computer few hours later i have an error in the screenshot.https://yadi.sk/i/rZJ7Fy2x3RR2v8 Nothing was bought, no orders in active orders, no log entries.According to settings it must be bought btc and sell it after with profit! So, bot doesn`t work for me. Please, fix it. 01/13 04:20:03 pm bittrex:bot:BTC/USDT: [strategy-2] transition to "waiting for order to be placed"
01/13 04:20:09 pm bittrex:bot:BTC/USDT: [strategy-2] transition to "order active"
01/13 04:26:10 pm bittrex:bot:BTC/USDT: [strategy-2] transition to "check whether order must be adapted"
01/13 04:26:11 pm bittrex:bot:BTC/USDT: [strategy-2] transition to "order active"
01/13 04:32:12 pm bittrex:bot:BTC/USDT: [strategy-2] transition to "check whether order must be adapted"
01/13 04:32:13 pm bittrex:bot:BTC/USDT: [strategy-2] transition to "canceling order"
01/13 04:32:21 pm bittrex:bot:BTC/USDT: [strategy-2] transition to "replacing order"
01/13 04:32:22 pm bittrex:bot:BTC/USDT: [strategy-2] transition to "creating buy order"
01/13 04:32:23 pm bittrex:bot:BTC/USDT: [strategy-2] transition to "waiting for order to be placed"
01/13 04:32:24 pm bittrex:BTC/USDT: no result in return message. Error string: "INSUFFICIENT_FUNDS". 01/13 04:32:24 pm bittrex:BTC/USDT: in placeOrder: placed order could not be found in api: Http post of method market/buylimit failed, with error string "INSUFFICIENT_FUNDS". 01/13 04:32:29 pm bittrex:bot:BTC/USDT: [strategy-2] transition to "error occurred waiting for reinitialization"
01/13 04:37:30 pm bittrex:bot:BTC/USDT: [strategy-2] transition to "replacing order"
01/13 04:37:31 pm bittrex:bot:BTC/USDT: [strategy-2] transition to "creating buy order"
01/13 04:37:32 pm bittrex:bot:BTC/USDT: [strategy-2] transition to "waiting for order to be placed"
01/13 04:37:33 pm bittrex:BTC/USDT: no result in return message. Error string: "INSUFFICIENT_FUNDS". 01/13 04:37:33 pm bittrex:BTC/USDT: in placeOrder: placed order could not be found in api: Http post of method market/buylimit failed, with error string "INSUFFICIENT_FUNDS". 01/13 04:37:38 pm bittrex:bot:BTC/USDT: [strategy-2] transition to "error occurred waiting for reinitialization"
01/13 04:42:39 pm bittrex:bot:BTC/USDT: [strategy-2] transition to "replacing order"
01/13 04:42:40 pm bittrex:bot:BTC/USDT: [strategy-2] transition to "creating buy order"
01/13 04:42:41 pm bittrex:bot:BTC/USDT: [strategy-2] transition to "waiting for order to be placed"
01/13 04:42:45 pm bittrex:BTC/USDT: no result in return message. Error string: "INSUFFICIENT_FUNDS". 01/13 04:42:45 pm bittrex:BTC/USDT: in placeOrder: placed order could not be found in api: Http post of method market/buylimit failed, with error string "INSUFFICIENT_FUNDS". 01/13 04:42:47 pm bittrex:bot:BTC/USDT: [strategy-2] transition to "error occurred waiting for reinitialization"